What I mean is do you find yourself leading? Stepping out and taking charge? Or living with a “must” act or do “something” passion? This is what I would consider the “call” to lead. We are all leaders to some degree as parents or friends. There are people we influence and affect as we speak wisdom and knowledge into other’s lives. Sometimes we just end up in leadership while other times we step up into leadership. Either way, is there a deep unquenchable desire to make something happen? If so, you may have the call to lead. Am I qualified to lead? This could be from an educational, experiential aspect or perhaps through consistent mentoring and training within a company. There are definitive qualities that organizations will set forth as they look for the leader to helm the ship. On a deeper level, there are certain core values that leaders must possess and maintain as foundations for their leadership to be effective. What are your values and character like? Are you qualified? Can you become qualified? Leaders are meant to burn and to blaze. Leaders should be trailblazers leading the organization into the wild unknown. As Proverbs 29:18 says “where is no vision, the people perish”, thus underlining the importance for the leader to cast vision. Do you have a vision of what could be? Would your vision be capable without you stepping up? Passion is the fuel that not only ignites but burns within the leader, motivating the leader as well as the team. Feeding the fire and being the one who fans the flame are both required for those who want to succeed in leading an effective team. If you don’t know what you are passionate about, don’t take a position on the team. The leader must know and be able to articulate with emotion what the passion of his heart is. How do I really feel about people? Some people simply want to be a leader because of the power and the prestige. Before taking on the role of leadership, be aware of how you really feel about people. Do you sincerely care about their futures? Their dreams? Their hearts? Or are you more concerned about yourself? The leader’s ultimate assignment is to care for people. Do you equip and empower people? Or do you feel like people just get in your way? How do you really feel? Do I spend time with people? It’s really hard to lead people when you are not around people. Leadership is not about sitting in an office, setting protocol and making money. Leadership as most people define it would be relational influence. The more time you spend with people, the more meaningful the relationship. If you don’t spend time investing in people in some tangible way, it will be very difficult to amass a following of committed people. The people who will carry you into the future are the people who feel like you are sincerely committed to them. Oftentimes the business world is most concerned with the bottomline. Leaders who do not grow the business, coaches who do not win championships, usually find themselves out of a job pretty quickly. One of the things that makes leaders effective over the long haul is to be personally growing and developing. With culture changing nearly every year, leaders must adapt and adopt new practices, technologies and evaluate everything that’s “old”. Someone once said: “Leaders are readers” and reading is essential to growing. Leaders can also use podcasts, audibooks, or group roundtables to enhance their growth. In this time in history, there is no real reason for a leader not to be growing. Who am I leading with? The days of the Lone Ranger leader are gone. Transparency, accountability, and integrity and on the short list of qualities people look for in bonafide leaders. Having a “posse” who rides along with you through life, keeping you on the right path and “getting your back” when the heat comes is highly valuable as a leader. 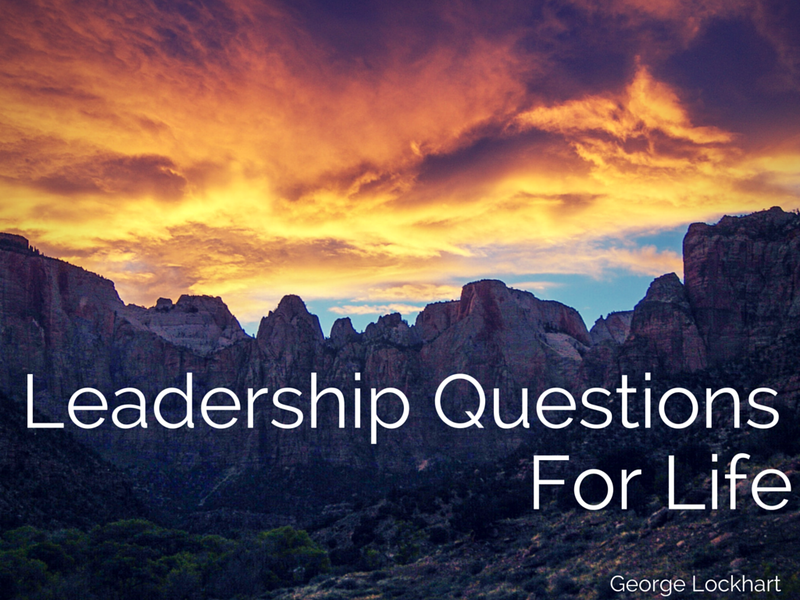 The question is, are there people who want to lead and do life together with you? Find those few people and do all you can to keep them close. Ignoring weaknesses is something leaders may be tempted to do but rest assured Satan knows where and when to attack. Not only knowing but preventing and strengthening weaker areas is something effective leaders must focus time and energy diligently. Pretending there aren’t weaknesses in leadership or within the organization is a recipe for disaster. Do you know where you are weakest? Are you doing something about it? These are just a few questions that I find helpful. How about you? Share your thoughts in the comment area. George Lockhart is the mission and creative arts pastor at New Vision Church in Fayetteville, GA and a missionary with Vision 2 Hear ministries.